AHF marks World AIDS Day and its own 30th anniversary with blowout free concerts in Miami, Los Angeles, Mexico, Haiti and Russia; In L.A. Maria Carey headlined electric show at Shrine Auditorium. At the Miami concert, AHF honored Mayor Yulin Cruz with its 2017 AHF Humanitarian Award for her ongoing and courageous leadership in the aftermath of Hurricanne Maria’s wrath. Yulin Cruz issued a special ‘Call to Action’ for further community support while AHF raised awareness & funds for its Power2PR relief campaign. MIAMI (December 1, 2017) To mark World AIDS Day and celebrate AIDS Healthcare Foundation’s (AHF) 30th anniversary, AHF hosted a free concert and community event at Miami’s Bayfront Park Amphitheater Friday December 1st with an enthusiastic and pumped up crowd of thousands. Hosted by comedian Aida Rodriquez and featuring Grammy-nominated artist and actress Sheila E., Latin Grammy Award-winning reggae artist Yandel and hot, new singer-songwriter Becky G., the event featured a special presentation by the Honorable Carmen Yulin Cruz, Mayor of San Juan, Puerto Rico. Mayor Cruz gave a moving update on post-hurricane Puerto Rico, sharing the current needs for recovery on the island and issued a ‘call to action’ for further community support. AHF Southern Bureau Chief Michael Kahane and members of the AHF Board of Directors also presented Mayor Cruz with AHF’s 2017 Humanitarian Award for her ongoing courageous and heroic leadership following the recent tragedies that devastated the island as a result of Hurricane Maria. 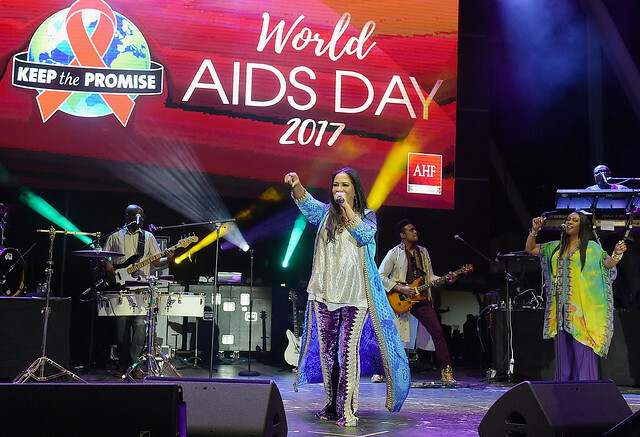 The free concert World AIDS Day concert (observed December 1st) and AHF 30thAnniversary Celebration in Miami was part of a series of events and concerts across the world to continue to spread awareness about HIV and AIDS. The activities include free concerts in Haiti, Mexico City, Russia and the United States as well as free awareness and testing events throughout the U.S., Africa, Latin America, the Caribbean, Eastern Europe and Asia.